When Margaret and Steve Frawley come home to Connecticut from a black-tie dinner in New York, their three-year-old twins, Kathy and Kelly, are gone. The police found the babysitter unconscious, and a ransom note from the "Pied Piper" demands eight million dollars. Steve's global investment firm puts up the money, but when they go to retrieve the twins, only Kelly is in the car. The dead driver's suicide note says he inadvertently killed Kathy. At the memorial, Kelly tugs Margaret's arm and says: "Mommy, Kathy is very scared of that lady. She wants to come home right now." At first, only Margaret believes that the twins are communicating and that Kathy is still alive. But as Kelly's warnings become increasingly specific and alarming, FBI agents set out on a desperate search. 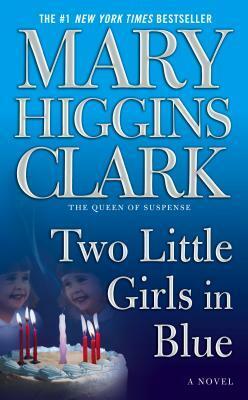 Two Little Girls in Blue is my fifth Mary Higgins Clark read. And I enjoyed it. It’s a wonderful book, and I was fascinated by the idea of twin telepathy, which made me pick up the book to read. Like every other Clark book I’ve read, this one is fast-paced, suspenseful, and it kept me reading into the night. Two three-year-old twins are kidnapped, and one, Kelly, is returned after some days with a suicide note saying the kidnapper unintentionally killed the other twin, Kathy. I couldn’t help but read more, as I wanted to see how Kathy would be reunited with her family. A good suspense, I like the way the story ended with the kidnapper revealed and all other crimes solved. I loved the chapters, short and quick, with most of them ending in a cliffhanger. My put off with this book, however, was the large amount of characters. I could count at least twenty-five named characters. And it was so hard to keep up with all of them. Also, I thought the outcome of the story was predictable. My favorite characters were Margret Frawley, mother of the twins and Angie Ames, one of the kidnappers. I thought there was enough depth to both characters, one of them, a loving mother in distress, the other, a psychopath and evil woman. I recommend this book to anyone who loves a good suspense. And if you’re interested in twin telepathy, then you should check it out. That being said, four (****) stars to Two Little Girls in Blue. I’m still going to read more titles from the author. I haven't read any Mary Higgins Clark books, but I am new to mystery and suspense. I like that your favorite characters are at odds with each other, a true battle it seems. The blurb caught my attention too. If only I could write one that good! Great review, Kaykay! Oh, I love Mary Higgins Clark. I like her books, especially the old ones (80s and 90s) I agree with you on the blurb. It's brilliant! I'm glad you like the review. It's a good story. Maybe it was kind of predictable because I've read lots of works by the author, so I always know what to expect. But trust Clark, she keeps you reading into the night.